A trail angel is someone who helps a hiker through acts of kindness. A kindness could be a hitch into town or back to the trail. It could be drinks and snacks left along the trail. Jugs of water left at trail junctions are especially appreciated during droughts. Some trail angels will even take hikers home with them, feed them, and wash their very odoriferous clothes! Mama Boots was a trail angel for me during my Appalachian Trail hike...albeit it was a long distance kindness. She had been encouraging me and sending me cards along my journey. I sent her post cards so she could keep up with my trek. In Kent Connecticut I got a card from her telling me she would arrange for me to stay a night with her niece, Mary Atwood in Falls Village, which was about a day and a half farther north. After Mama Boots made the arrangements, I called Mary and we finalized the plans. I hiked into Falls Village and located the house. Mary and her son were visiting colleges and did not return until later that night. Mary and I had never met, but she left the door unlocked so I could get cleaned up and rest. Later that evening I enjoyed meeting Mary and learning about her interesting life. It was a wonderful respite thanks to Mama Boots. Mama Boots is not only my mentor, she is a mentor and hero to many girls and women. She has hiked all of the Appalachian Trail, and much of it twice, while leading girl scout troops. Over a 20 year period she lead groups nearly every summer. She is definitely a hero, and I think she should be held in the same high regard and esteem as Grandma Gatewood and other pioneer women hikers. After all, Mama Boots hiked the AT the hard way. Planning and organizing section hikes to teach girls how to live in the woods is not easy. As the hikes got farther from her home, transportation and resupply became major issues. There are many women hiking and working with young girls today who were mentored by Mama Boots. Besides hiking the AT, Mama Boots and the girl scouts helped build and maintain the McConnell Loop Trail in Jefferson Memorial Forest near Louisville, KY. She continues to work with the girl scouts during their week long camps and jamborees. She loves the Appalachian Trail and is dedicated to the AT Museum. 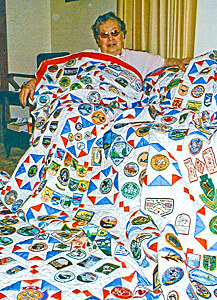 She helped make a quilt that was auctioned as a fund raiser. 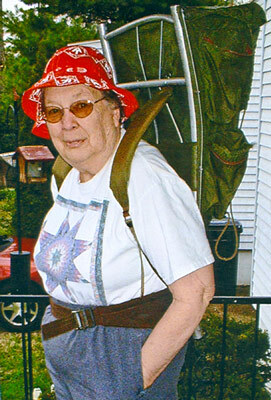 She donated many items to the museum, including her backpack and other gear, AT Journals, and a quilt that displays many hiking patches. She wrote the book APPALACHIAN TRAIL IN BITS AND PIECES. The book chronicles the stories of hiking the AT with the girl scouts. Proceeds from the book go to the AT Conservancy. Yet another way she gives back to the trail and hiking community. Mama Boots is Mary Sands from Louisville, KY. She is now 80 years old. She doesn't hike as much as she would like to these days. But it is always a joy to get together with her and "talk trail". She is not only my trail angel, my mentor, and my hero...she is also my dear friend.